THIS CLE PROGRAM PREVIOUSLY SCHEDULED FOR THIS SATURDAY MARCH 25 HAS BEEN POSTPONED. FURTHER DETAILS WILL BE FORTHCOMING. 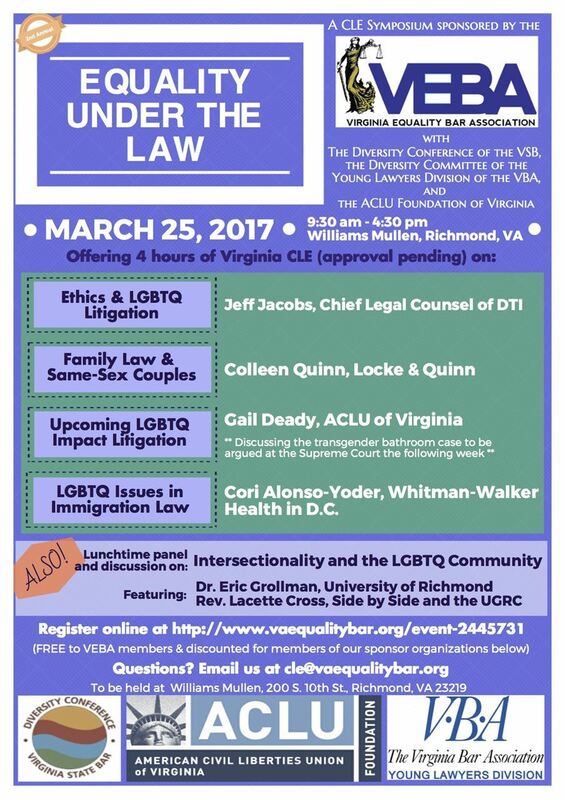 Please join the Virginia Equality Bar Association on March 25, 2017 for our 2nd Annual "Equality Under the Law" CLE Symposium. The Symposium will be held at Williams Mullen in downtown Richmond, at 200 S 10th St, Richmond, VA 23219. Boxed lunch selections are made during the registration process. Monday March 20 is the deadline for lunch orders. Paid parking is available in the James Center II parking deck (enter off 10th). This program is co-sponsored by the Diversity Committee of the Virginia Bar Association Young Lawyer's Division and the ACLU of Virginia Foundation. 11:10-12:10 p.m. Colleen Quinn, of Locke & Quinn in Richmond, will present "Family Formation, Protection and Preservation for LGBTQI Families in VA: An Overview of Adoption and Assisted Reproductive Technology (ART) Arrangements and Legal Protection via Court Orders, Agreements and Basic Estate Planning"
1:20-2:20 p.m. Gail Deady, The Secular Society Women's Rights Legal Fellow of the Virginia ACLU, will speak about Gloucester County School Board v. G. G., which will be argued at the Supreme Court of the United States the following week. 2:30-3:30 p.m. Cori Alonso-Yoder, supervising attorney at Whitman-Walker Health in Washington, D.C. will present on Immigration Law issues affecting LGBTQ clients.